I'm so thankful to join up with Sweetbottoms Boutique on Purposeful Homemaking again for another review and giveaway! I love, love, love all the goodies that can be found in this little one-stop baby and Momma boutique! Some of my favorite items that I have personally used are their cloth diapers (HUGE variety), alcohol free hand sanitizers (I like both the personal size for my purse and the larger size for the car!) and the Gypsy Mama Water Wrap Baby Carrier I got to review for this event. At Sweetbottoms Baby Boutique you'll find things like natural teethers, feeding essentials, baby carriers, nursing essentials and more! But, really, you need to check out their site to see all the wonderful goodies that they have! All US orders and select Canada orders qualify for free shipping! But, now, let me tell you about the product I reviewed for the Summer Celebration Event! 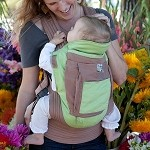 One day, I was browsing through the Sweetbottoms site and came across THIS: A baby carrier designed for the water! I was incredibly excited when I found out I had the opportunity to review it! A wrap like this is great if you have several children and want to keep your youngest one close to you while the others play. I am new to the "wrap world" with this being my first wrap to use. However, for the position above, I found it to be very easy to do--even for my directionally challenged mind! This water wrap is designed for babies from full term birth to 25 pounds. Our youngest is actually at the 27 pound mark but he still fit great and I didn't find him to be too heavy, especially with the lightweight feel when we were in the water. As you can tell from the picture below, he is having a good time! AND, it has a UPF of 45 to help prevent sunburn and minimize sunscreen use, especially if you have a little one 6 months and under. I used our Ergo Baby Carrier a TON with our youngest (who also happened to be the first child that I "wore" much--and by the way LOVED it! ), but a nice dark wrap like this would be great as a more elegant look if you're out in the evening or for a special event rather than a more bulky carrier. This wrap retails for $64 and comes with a detailed instruction sheet (complete with pictures) on how to use it. Thanks so much for visiting Purposeful Homemaking. I'm so glad you did! Please take a moment to "Like" me on Facebook, follow me on Twitter or stay connected with Google Friend Connect. **Disclosure: This post contains affiliate links. I also received product from Sweetbottoms Baby in exchange for an honest review. No other compensation was received.